Richard Parks, the former Wales flanker, is this week’s ultimate saint as he achieved the fastest ever solo, unsupported and unassisted journey to the South Pole by a Briton, and the first by a Welsh national. Parks, 36, reached the pole on 4 January, having taken 29 days, 19 hours and 24 minutes to ski there from the geographical coastline of Antarctica. He took just under ten days off the previous British record, set by polar explorer Hannah McKeand in 2006. For the full details of Parks’s amazing journey, follow this link to his website. London Wasps’ half-backs Andy Goode and Joe Simpson piloted their team to a hard-fought 19-16 victory over Exeter Chiefs in the Aviva Premiership, with outside-half Goode kicking 11 points and scrum-half Simpson scoring Wasps’ only try. The Chiefs had led 13-3 at half-time but Wasps battled back and Simpson’s try on the hour gave them the lead for the first time. The No 9 played a crucial role at the other end of the pitch with ten minutes to go when his tremendous tackle stopped Henry Slade from scoring what could have been a match-winning try. Then, with the last kick of the match, Goode – who had already kicked two penalties and a conversion – coolly slotted a drop-goal which gave Wasps the 19-16 win. Their director of rugby Dai Young said: “It was a big second-half performance and a good result. We’ve been on the end of a last-minute kick going against us so we probably deserved one. 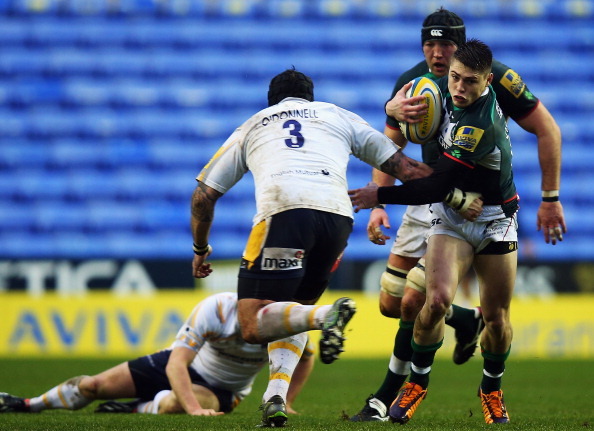 James O’Connor scored his first try for London Irish and kicked their other 17 points to take his new team to a critical Premiership win over Worcester Warriors. Irish, who had been in danger of slipping into the relegation battle, won their crucial clash with the bottom club 22-9 and climbed above Newcastle Falcons in the table too. O’Connor, who joined Irish in October after losing his place in the Wallaby squad, is being courted by several French clubs for next season, but for now the ridiculously talented 23-year-old Australian is proving to be a key man for the Exiles. Northampton Saints and Harlequins were slugging it out in a tight Premiership battle and had been deadlocked at 6-6 at half-time. Then Wales wing George North smashed his way through an attempted tackle by Charlie Walker and charged through for a try which gave the Saints a 13-6 lead and they never really looked back from there, going on to win 23-9. From that point on, Northampton had almost all the momentum in the match – it was a game-changing moment from a special talent. After 16 months of trying, Zebre finally achieved their first home win in the RaboDirect Pro 12, beating Italian rivals Benetton Treviso 14-12. Zebre, who were formed at the start of the 2012-13 season, lost every league match last term but broke their duck with an away win at Cardiff this season. However, their home fans had had nothing to cheer until this weekend, when three Luciano Orquera penalties and a try by Guglielmo Palazzini took Zebre to victory. Gloucester’s pack have some soul-searching to do this week after being out-muscled by a seven-man Saracens scrum which included Brad Barritt in its number. Gloucester had been well and truly outplayed by Saracens at Kingsholm and were 26-3 down, but were enjoying their one period of pressure. Billy Vunipola and Steve Borthwick were sin-binned within a couple of minutes of each other, which meant Kelly Brown was moved up to the second row for a five-metre scrum and Barritt joined the back row. Billy Vunipola and Saracens put in an outstanding performance in their Aviva Premiership triumph over Gloucester, but the England No 8 ended up with one black mark against his name after arguing with referee Luke Pearce when he was shown a yellow card. Instead of turning tail and heading for the touchline, Vunipola walked over to the official to argue the point with him. 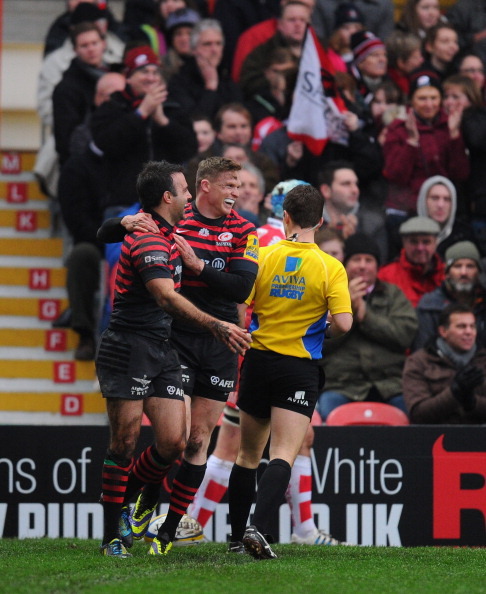 Thankfully his captain Steve Borthwick quickly intervened to send Vunipola on his way. The young No 8 needs to remember that in rugby, whatever the perceived rights or wrongs of a decision, you do not argue with the ref. England lock Courtney Lawes had a Northampton win over Harlequins to celebrate this weekend and may also have counted himself a little lucky not to be shown a yellow or even red card for elbowing George Robson in the head. He was trying to loosen the grip the Harlequins lock had on him, but a swinging elbow is a dangerous way to go about it. The match officials looked long and hard at the video replays but only a penalty resulted. A lot of armchair viewers would have carded Lawes.